The need for broadband services among community anchor institutions in rural, economically distressed Oconee County, South Carolina, has escalated significantly beyond current resources, hampering economic growth in the region. Oconee FOCUS, a public-private partnership between the county, several local small businesses, and the Eastern Band of Cherokee Indians, proposes to build a fiber-optic middle-mile network to serve community anchor institutions in the rural parts of the county and connect with high-speed networks across the state. The project aims to improve the Oconee region’s attractiveness to employers, promote public safety and health, and enhance educational opportunities by enabling distance learning, video conferencing, and remote research. Oconee County connected 70 community anchor institutions to its network through June 2013. 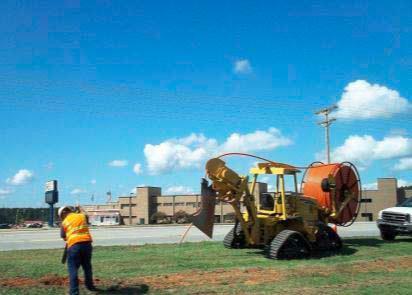 The Oconee Fiber Optics Creating Unified Solutions (FOCUS) project, a public-private partnership between the county, the American Red Cross, several local small businesses, and the Eastern Band of Cherokee Indians, built a 245-mile fiber-optic network to serve rural community anchor institutions. Oconee FOCUS aimed to attract employers, promote public safety and health, and enhance educational opportunities through distance learning, virtual classes, and remote research. Improving the quality of educational organizations in Oconee was one of the primary goals of the project. For example, South Carolina requires all students to electronically complete certain exams. However, many schools in Oconee County were unable to comply due to a lack of bandwidth. The Oconee FOCUS high-speed fiber network helped more than 20 schools to comply and provide students with the necessary level of support to successfully complete their education. NTIA’s BroadbandUSA promotes innovation and economic growth by supporting efforts to expand broadband connectivity and digital inclusion across America. BroadbandUSA serves as a strategic advisor to state and local government, industry and non-profits to expand broadband capacity and promote digital inclusion.